It was Christmas Eve 1946 when Western Air Lines Flight 44 departed the town of Holtville in California's Imperial Valley for the coastal city of San Diego. The flight was to continue on to Long Beach with it's final destination Los Angeles International Airport. 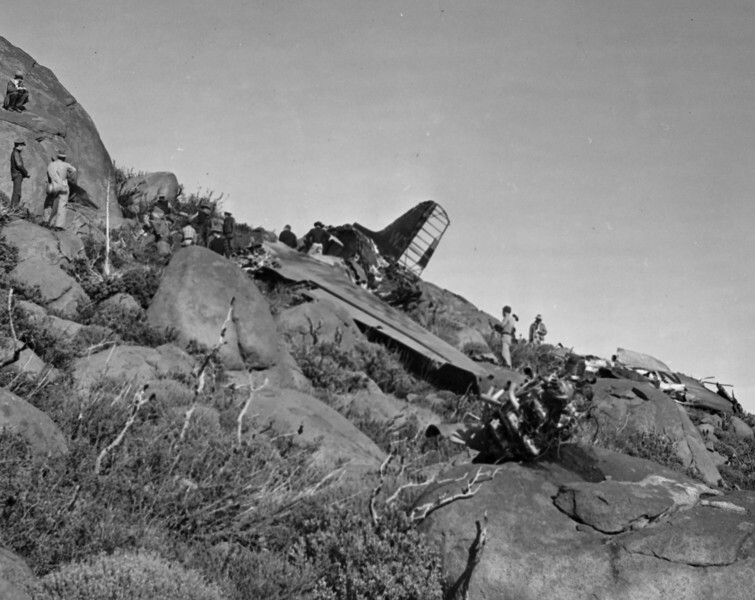 Flight 44 had nine passengers and three crew members when the DC-3 began it's westerly climb from Holtville to cross the mountains and foothills that make up the eastern coastal range of San Diego. The twin-engine airliner was cleared by the tower at Lindbergh Field in San Diego to fly under contact (visual) rules at an altitude of 7,000 feet. The night was cold and dark with rain and overcast prevailing along most of the route. 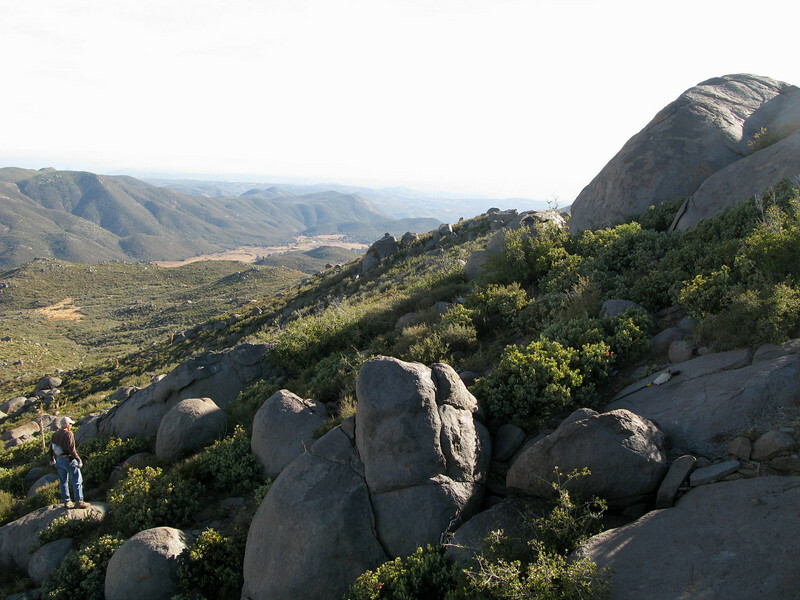 Upon reaching it's cruising altitude of 7,000 feet, the flight was still east and approaching the vicinity of Mount Laguna. Maybe it was the dark night, a mistaken visual ground reference, or possibly the pilots misread their flight instruments. The fact is no one will ever know why Flight 44 began it's premature decent into San Diego's Lindbergh Field. 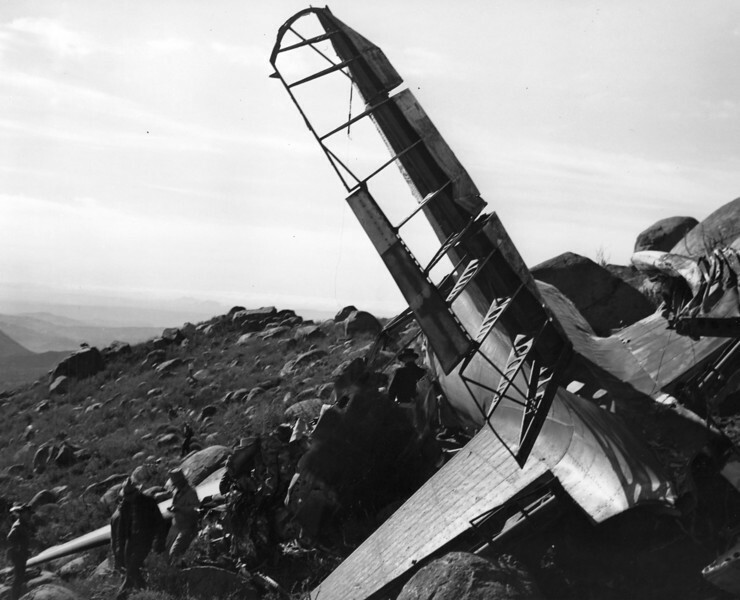 At 7:19 PM, while traveling nearly 175 miles-per-hour, the DC-3 struck the eastern slope of Cuyapaipe Mountain at an elevation of 6,120 feet.The impact instantly demolished the aircraft into a burning pile of metal. All twelve were killed outright. Because of bad weather, it took searchers nearly three days to discover the smoldering wreckage and ground search parties more than six hours to reach the plane by horseback. 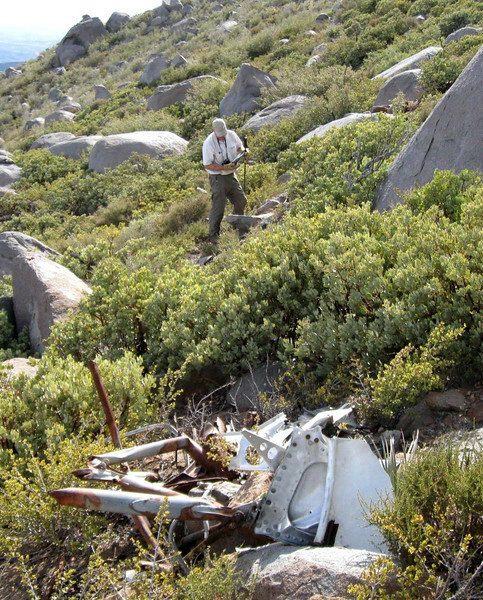 By coincidence Western Air Lines Flight 44 crashed less than a mile from where American Airlines Flight 6-103 met it's own fate just nine months prior (see story). The probable cause for either accident remains undetermined to this date. 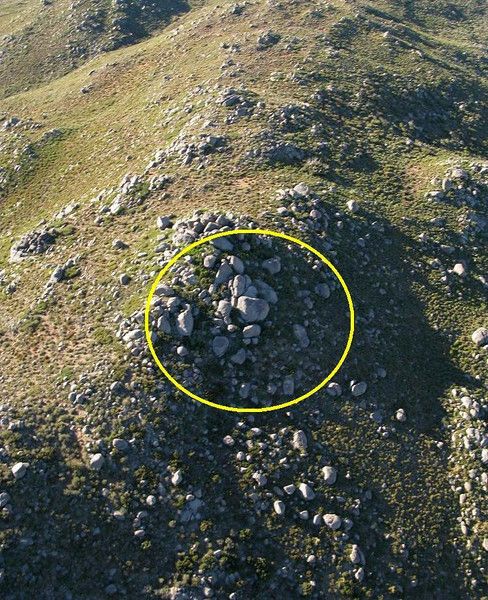 First located by air during a 2003 re-position flight, this site and another located within a half mile has intrigued me for years. 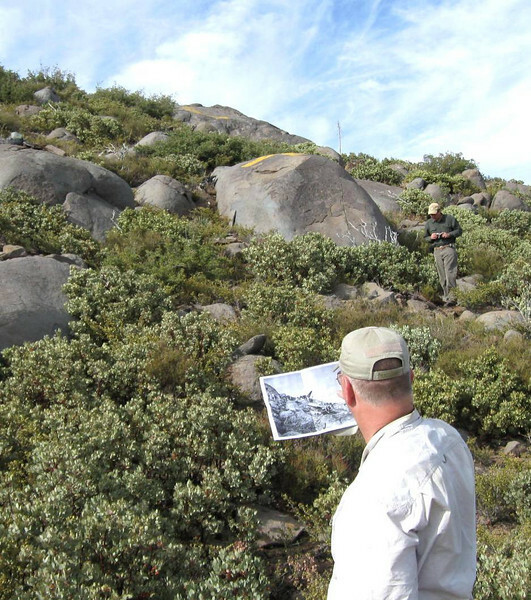 Having known and researched the 1946 mishaps of two golden-age airliners that crashed in this area, visiting these sites were on the top of my aviation archaeology list. 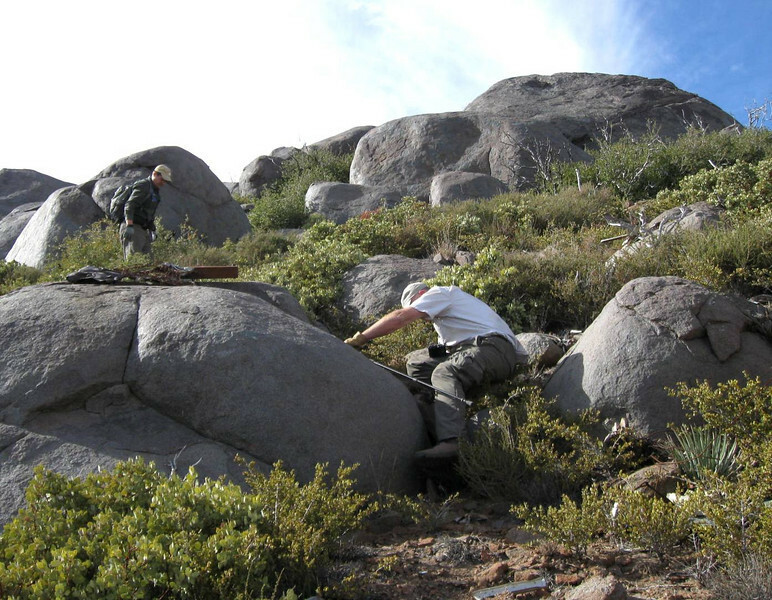 On November 9, 2009, I had the opportunity to hike into this remote location on Cuyapaipe Mountain with fellow wreckchasers Trey Brandt and Steve Owen. 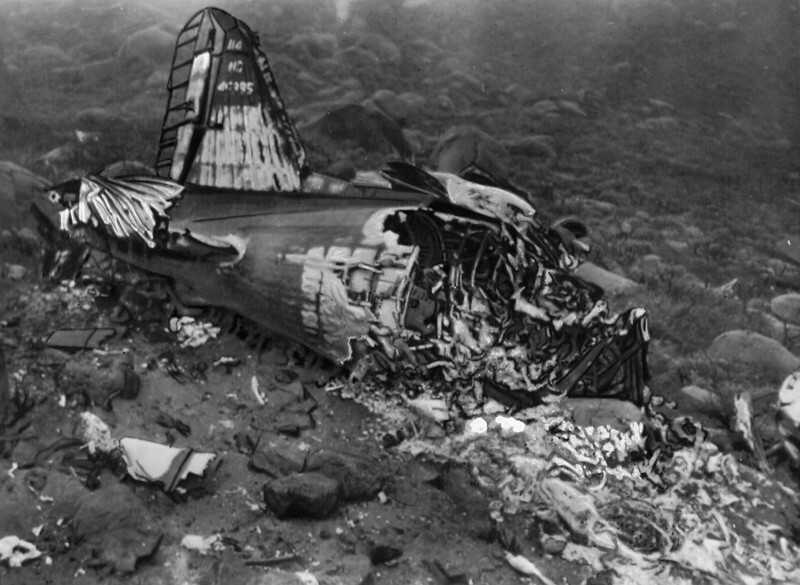 Our first discovery was not a DC-3 at all, but a Piper Cherokee that crashed in 1968 (See story in General Aviation Archaeology). The second site we visited that day was the ill-fated Flight 44. 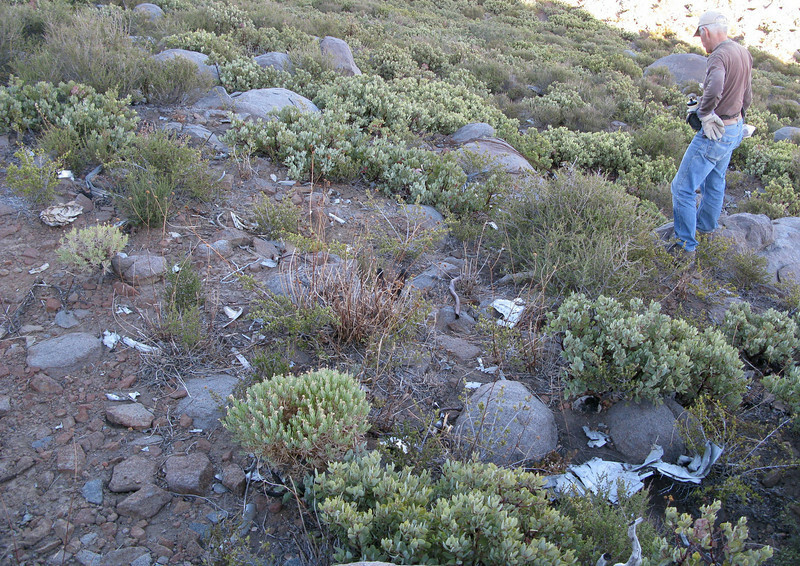 The site, as many commercial airline crash sites had been "cleaned" of large fragments. Gone was the tail section, wings, and complete whole engines. 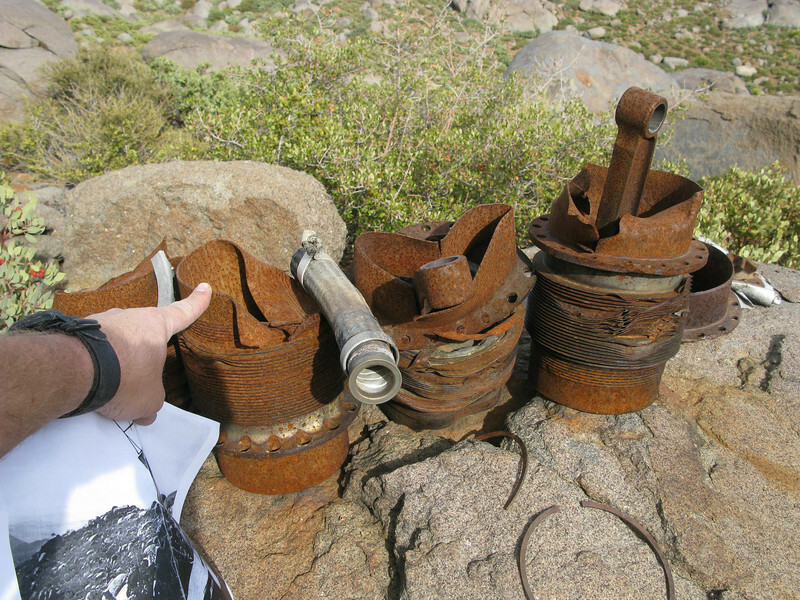 All that remained were fragments of structure and components. 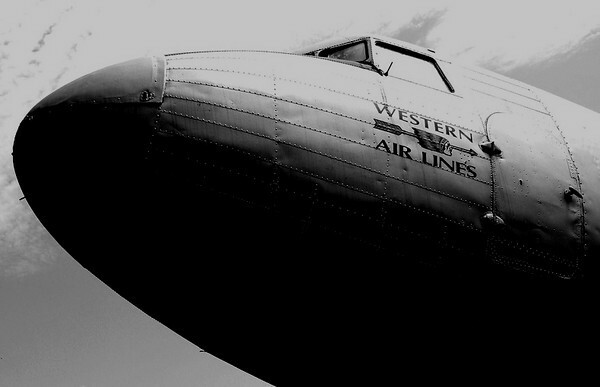 Founded in 1925, Western Air Lines was a large airline based in California, with operations throughout the Western United States, and hubs at Los Angeles International Airport and Salt Lake City International Airport. 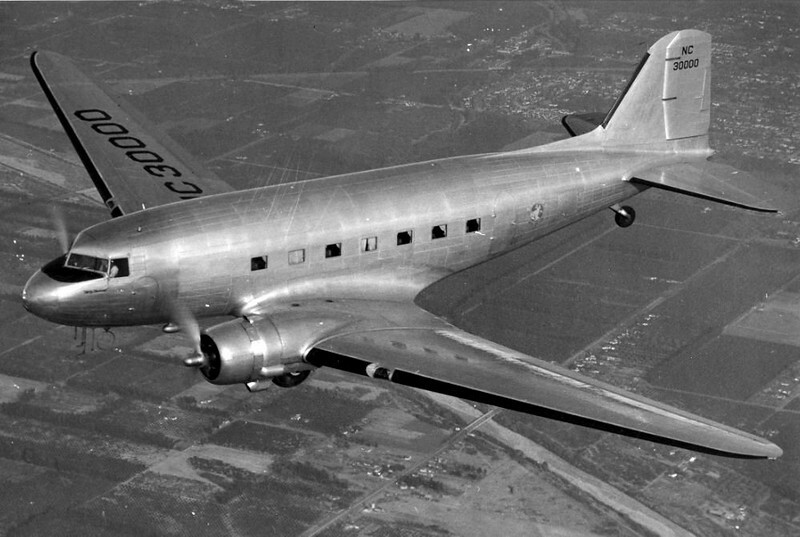 During the 1940s, Western Air Lines operated a fleet of Douglas DC-3 Airliners. Western Airlines ceased operations on September 9, 1986. Douglas DC-3 (NC45395) S/N: 11642, was a converted C-53D-DO that was utilized as a troop and cargo transport by the military during World War II. The aircraft accumulated a total time of 3,699 hours since it's first flight in 1943. The aircraft was leased from the War Assets Corporation and modified to Western Air Lines specifications. 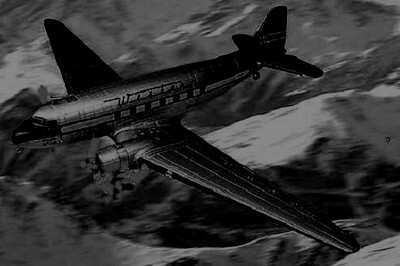 The aircraft was placed into commercial service by Western Air Lines on December 13, 1945. 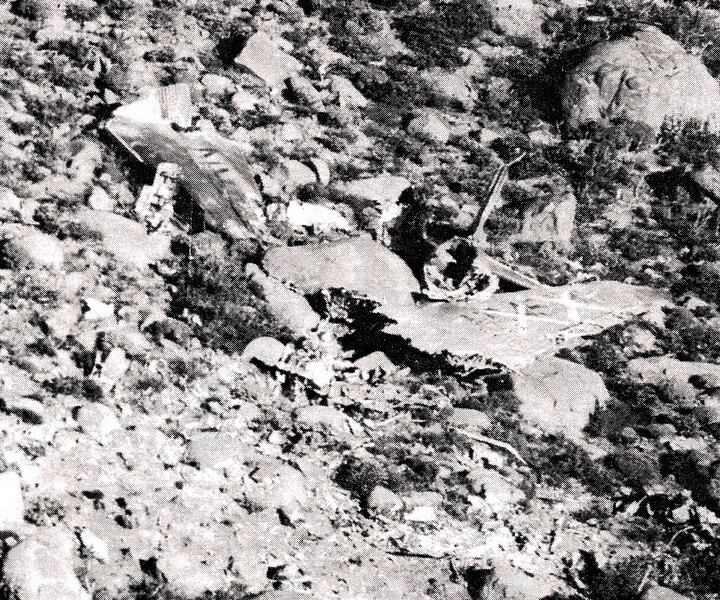 A greeting of "Merry Christmas" was the last communication from Western Air Lines Flight 44 to the Laguna Mountain controllers on duty. 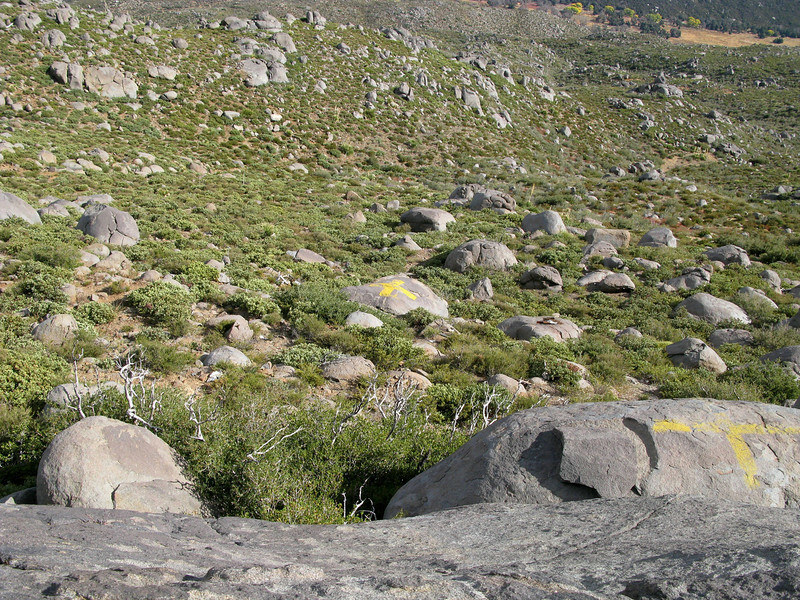 During the 1960s, the wreckage of WAL Flight 44 was marked by painted yellow "X"s to mark the site as a known crash site. 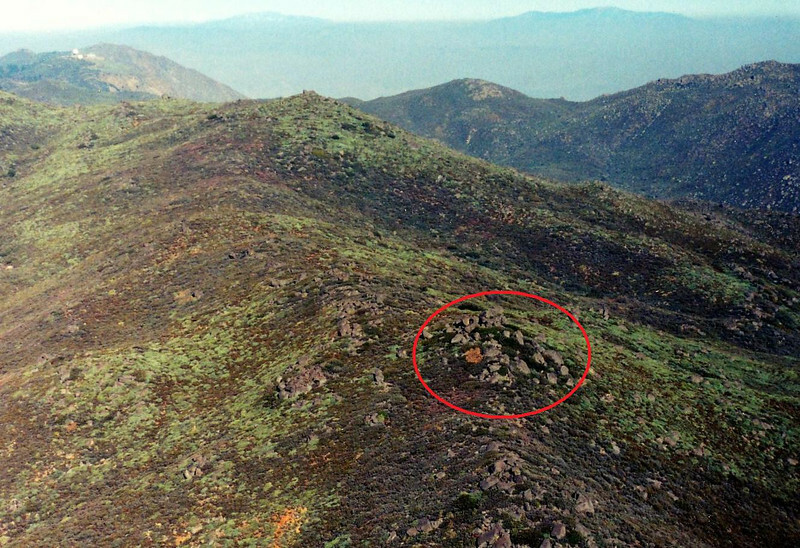 During a re-position flight in 2003, the wreckage of Western Air Lines Flight 44 was spotted near the top of this ridge. 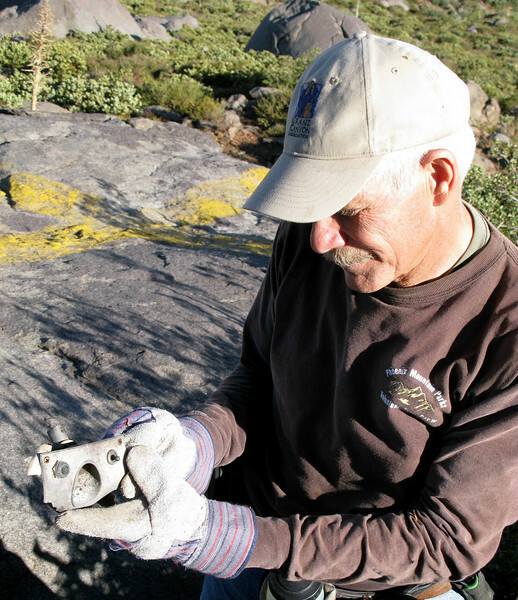 Over the years the large pieces of wreckage marked with painted "X"s were removed by salvage teams. 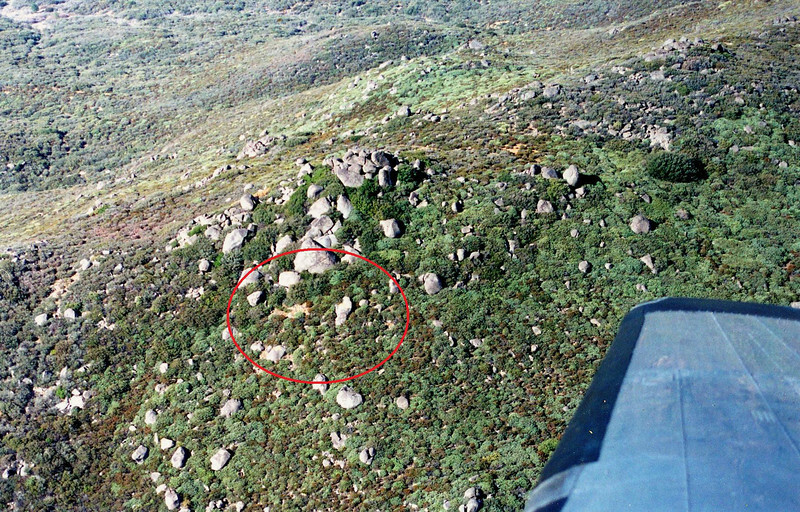 With wreckage still visible, the site was again marked by "X"s that were painted on large boulders. 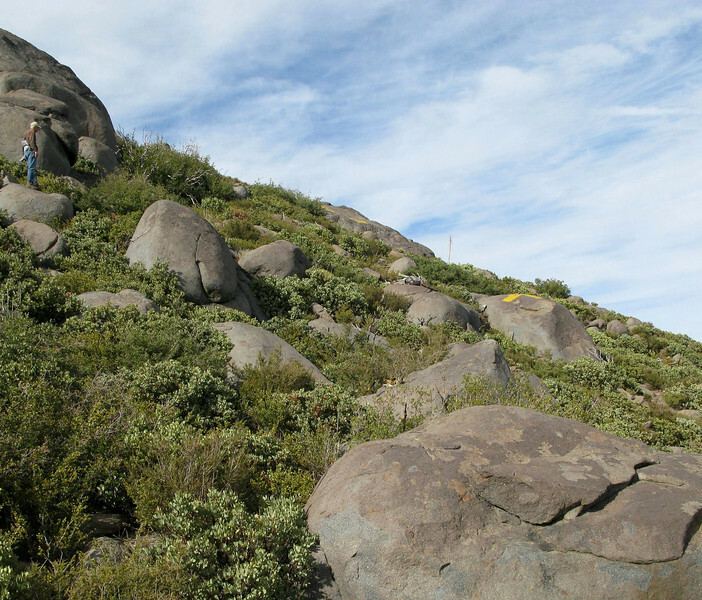 This photograph of the site was taken on 9/24/09. 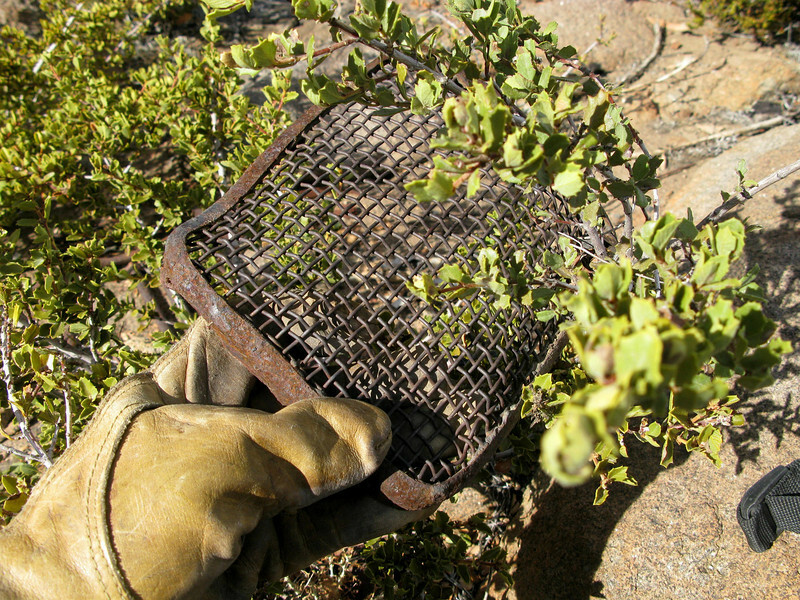 A brush fire that swept through the area a few years prior helped reduce the amount of vegetation surrounding the site. 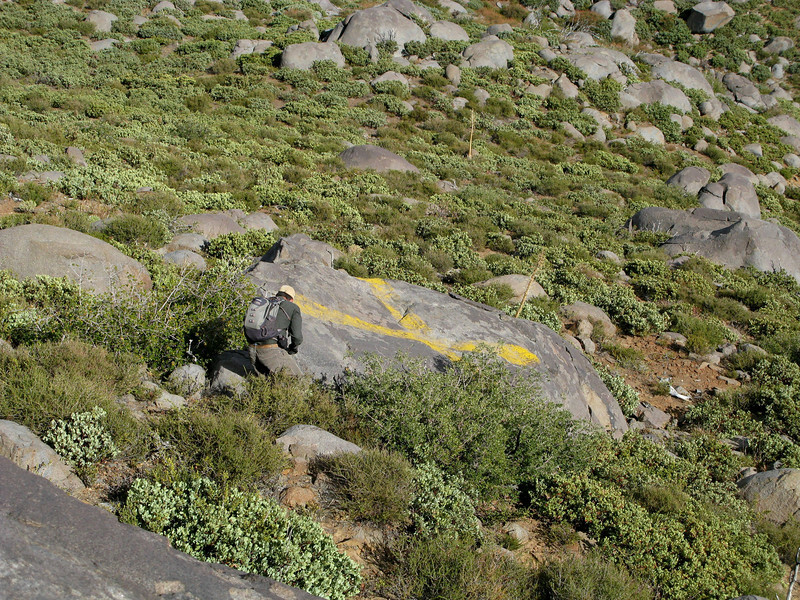 With wreckage present, the painted yellow "X"s were visible confirmation that we were at the crash site I had seen from the air in 2003. 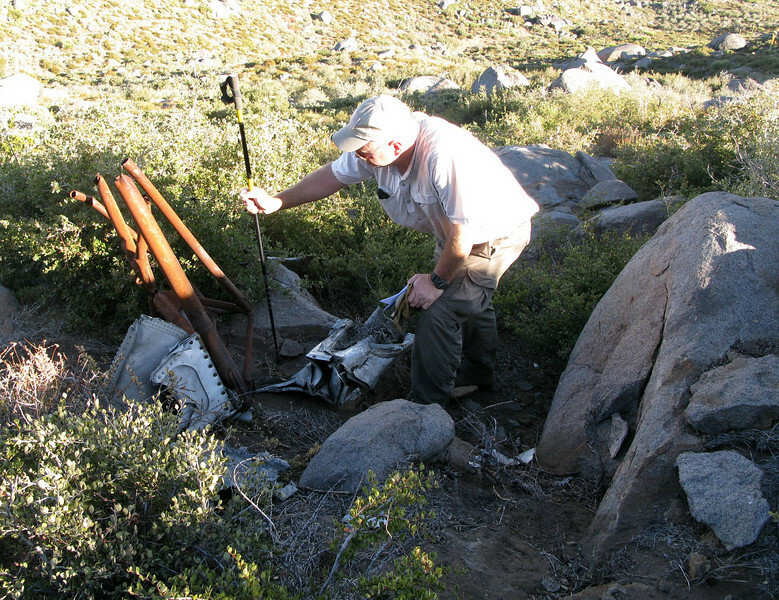 Trey examining a wreckage fragment at the DC-3's main impact point. 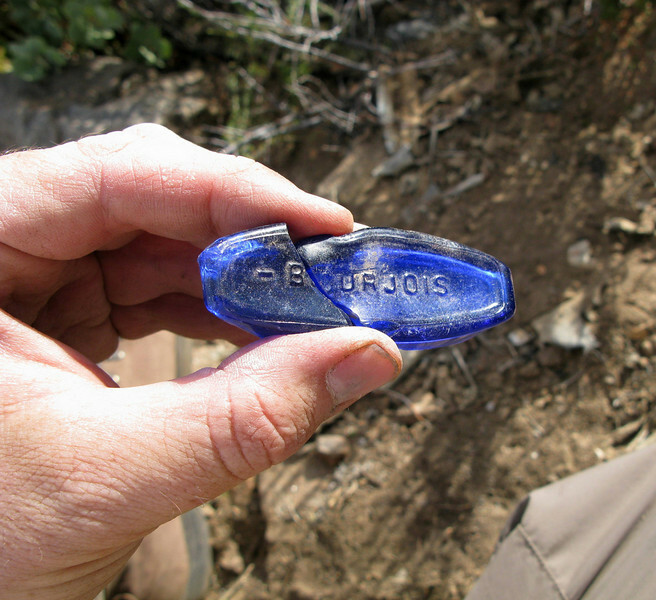 Small fragments littered the site. 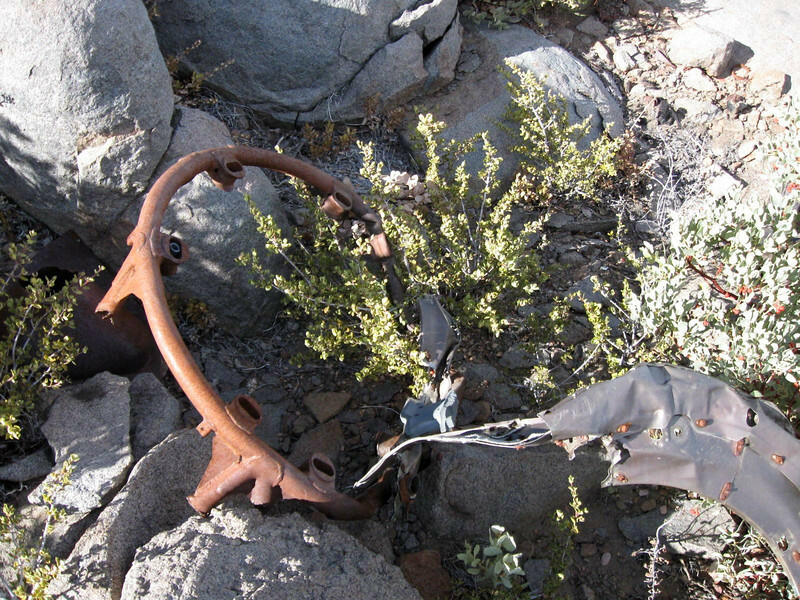 An engine mount that supported one of two Pratt & Whitney S1C3G engines. This was one of the largest fragments still present at the site. 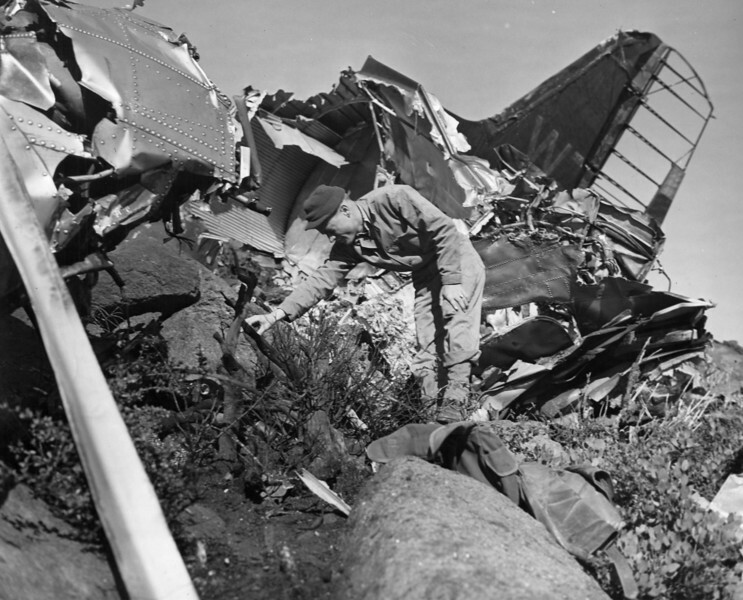 Craig Fuller of Aviation Archaeology Investigation and Research (AAIR) generously provided our team with photographs taken during the 1946 recovery efforts. 2009 - The same view taken during our November visit. Nearly 63 years later. 2009 - The same view looking south during our visit. The tail section was most likely taken apart and hauled away for it's scrap value. Steve Owen examining a passenger cabin overhead reading lamp and switch panel. This photo illustrates the passenger overhead reading lamp used in the DC-3's cabin. 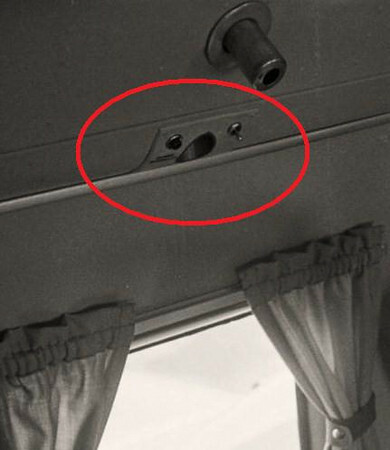 This another type of passenger light/call button switch panel. 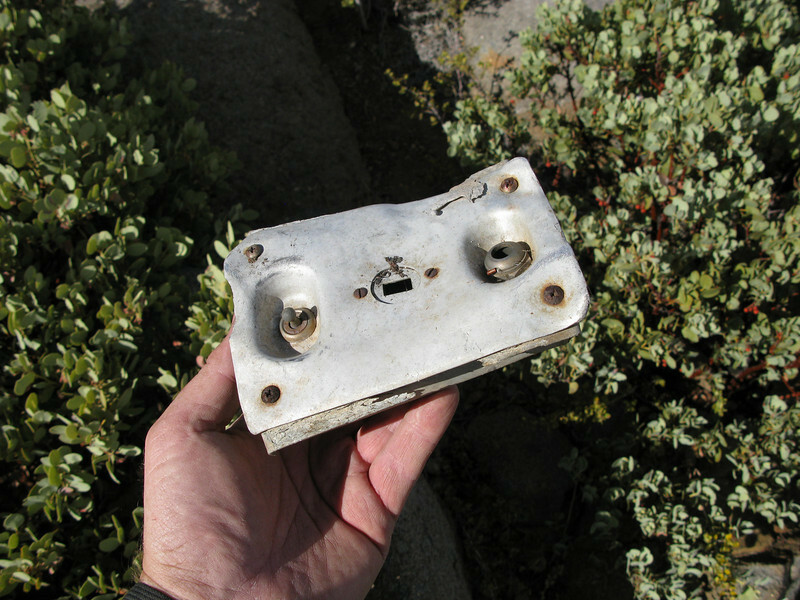 A two-way selector switch was located in the middle. 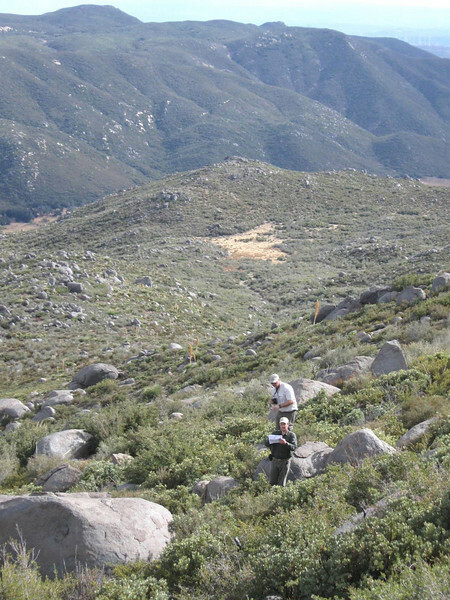 A view of the site looking south. This data placard would have been located on the engine exhaust manifold. An important item as it refers to the DC-3's original configuration as a military C-53. 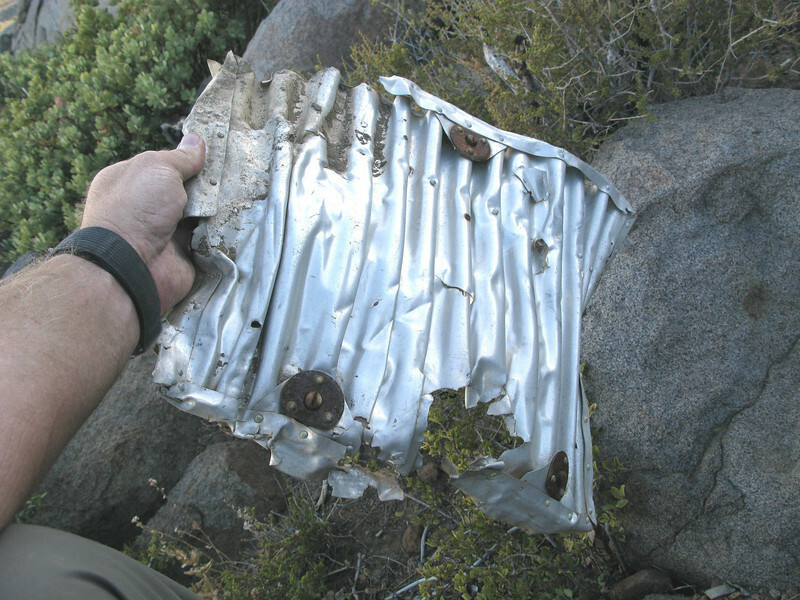 An engine firewall pan assembly was another identifiable fragment. 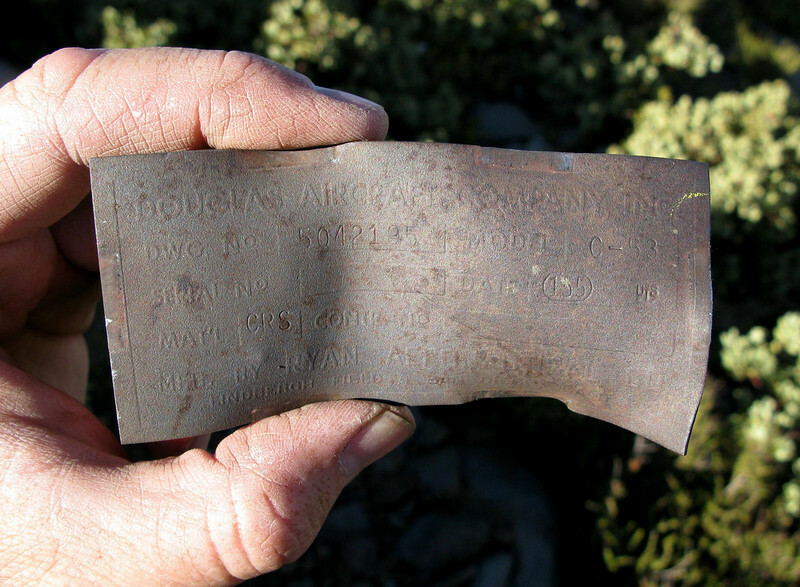 An important find we made at the site were these fragments from one of Flight 44's two pressure altimeters. 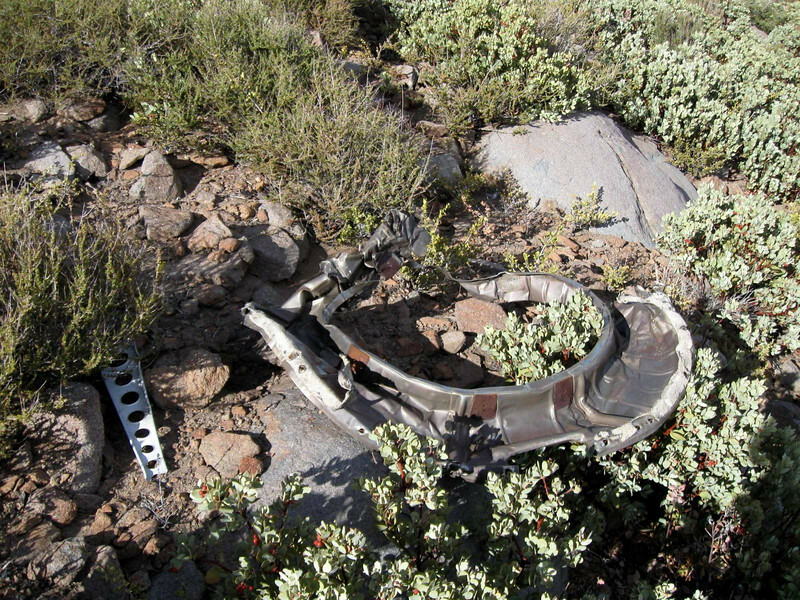 According to the Civil Aeronautics Board (CAB) report both altimeters were recovered and closely examined by the CAB accident investigators for any errors. Apparently, this examination was made on-site and not in the lab. 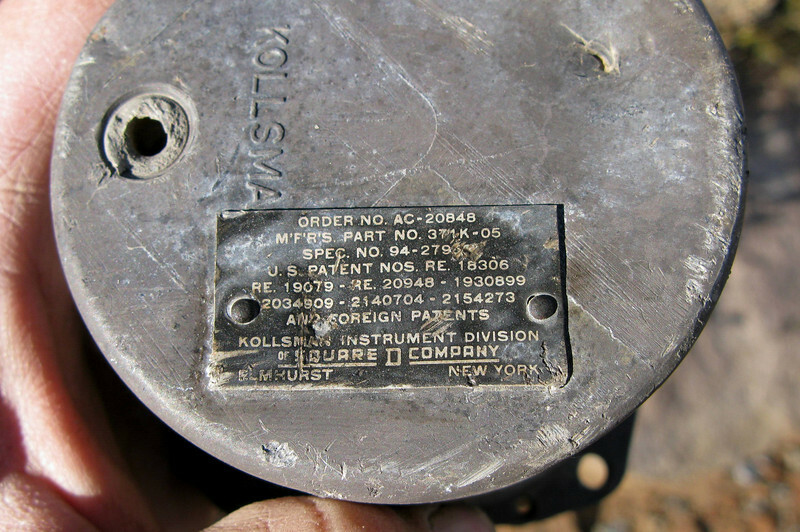 The data plate from the recovered Kollsman Pressure Altimeter. 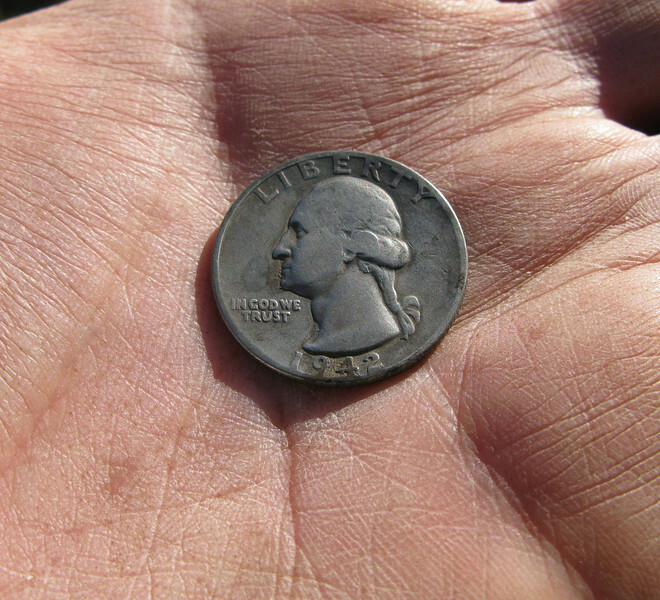 A fairly common sight at civilian and commercial accident sites is the presence of coin money such as this U.S. 1942 Quarter Dollar coin. 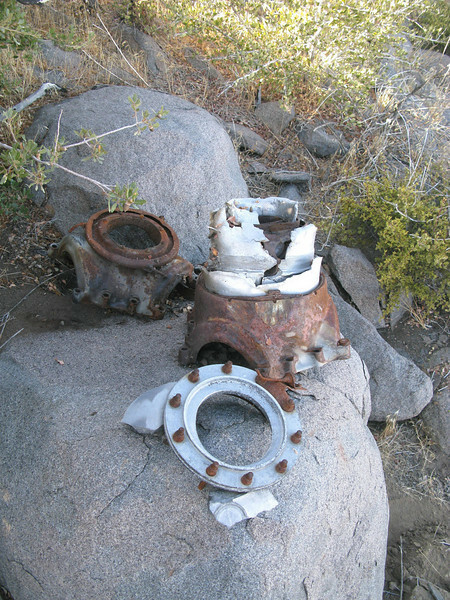 We located one of the propeller dome assemblies, but someone, possibly CAB accident investigators disassembled the hub during the on-site investigation. 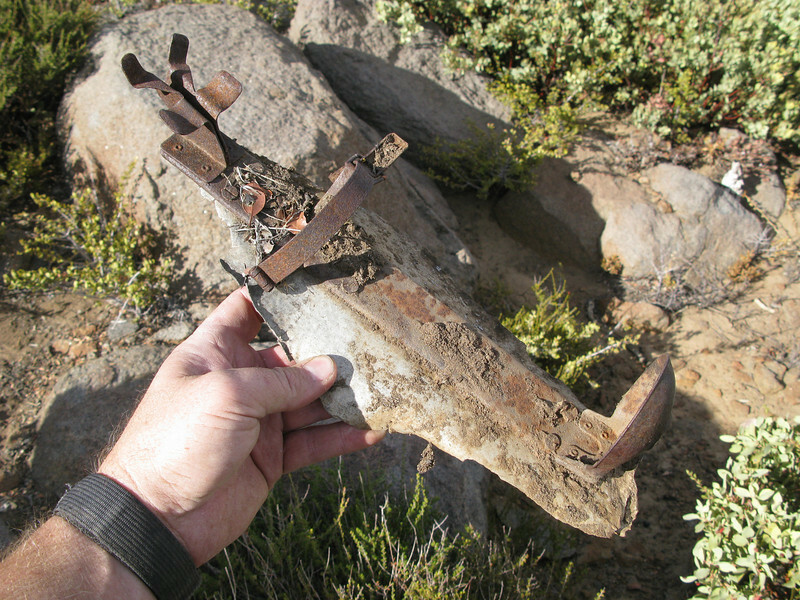 The only propeller blades located at the site were small fragments. 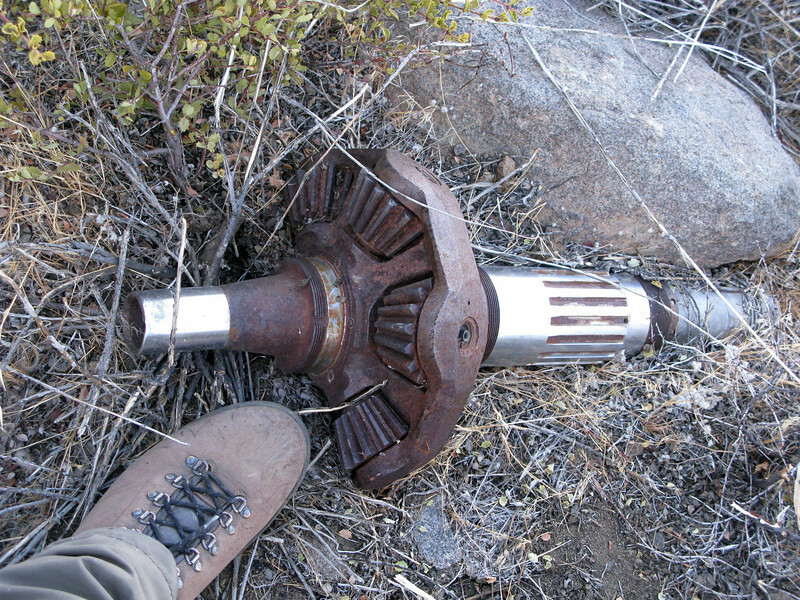 This engine/propeller reduction gear assembly was found near the disassembled propeller hub. 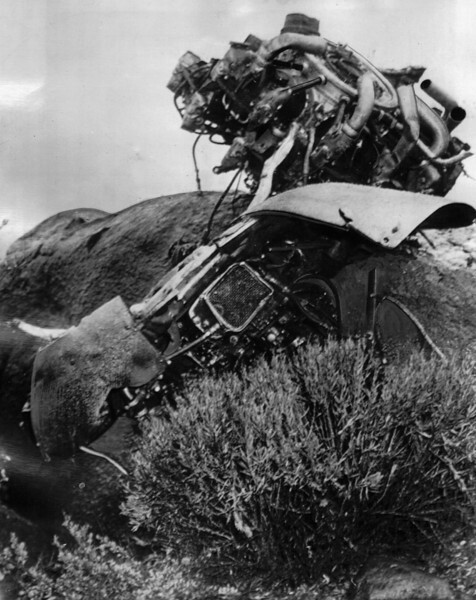 Three engine cylinders were found on this boulder. It appears that one or both engines were taken apart by the CAB investigators during their on-site examination. 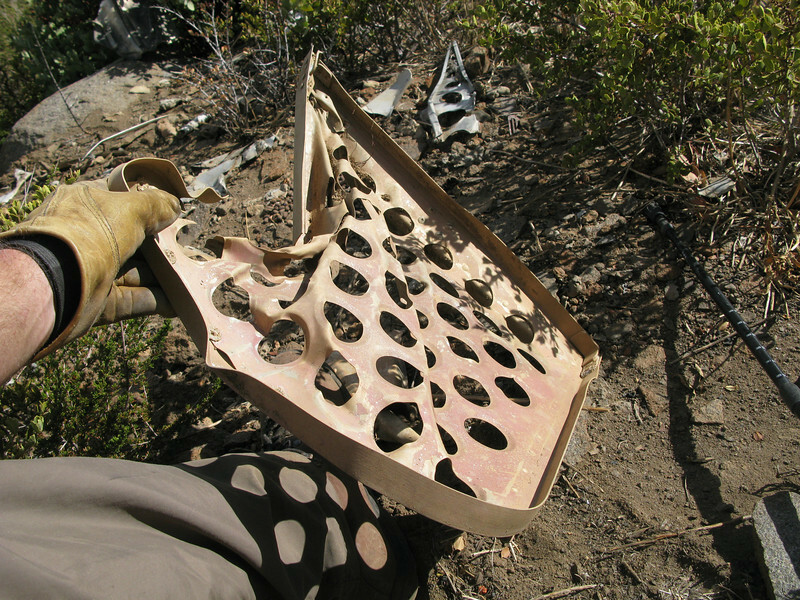 A seat pan from from one of the pilot's crew chairs in the cockpit. An engine carburetor intake screen. 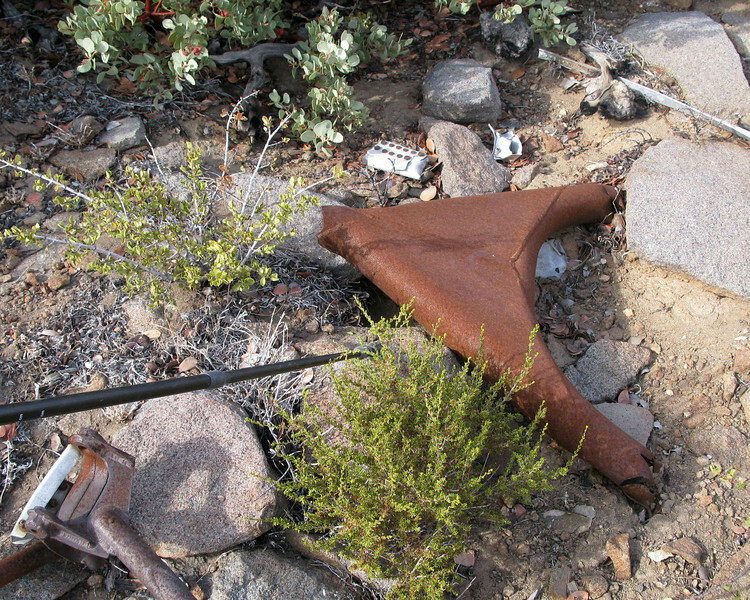 Sheared from it's mounts, the remains of a main landing gear brace leg. 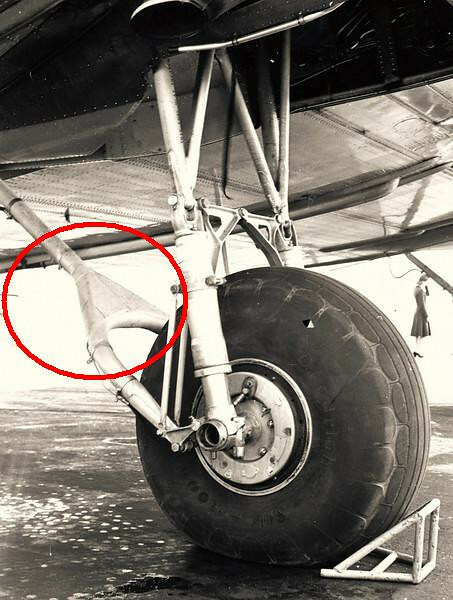 This photo illustrates the original position of the landing gear brace leg. Despite the severe impact and over six decades of weather, this fire extinguisher/fire bottle bracket was in surprisingly good condition. 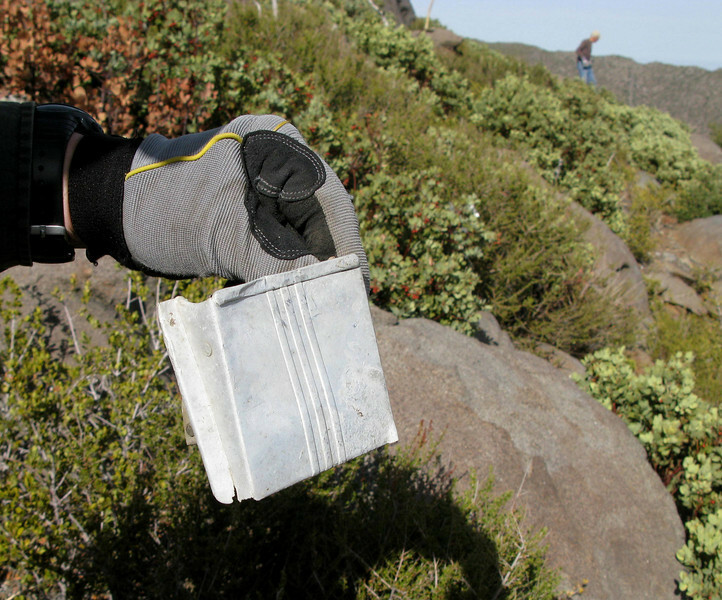 A glass container fragment from cosmetic manufacturer "Bourjois" of Paris, France belonged to one of Flight 44's female passengers. 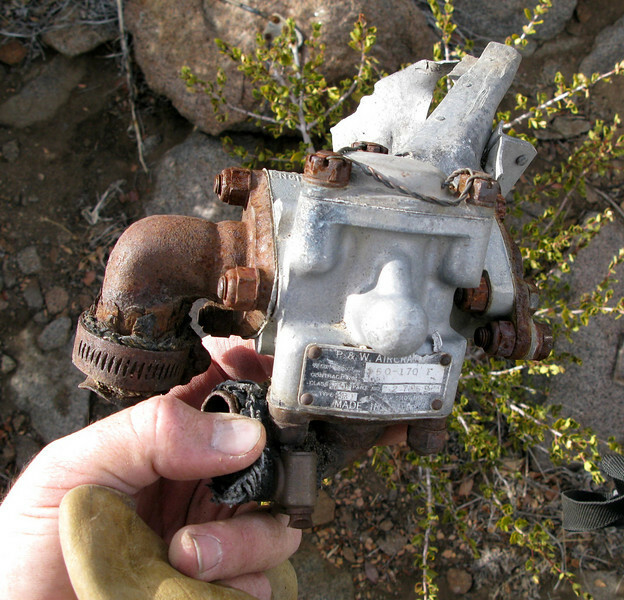 This fuel shutoff valve was manufactured by Pratt & Whitney. 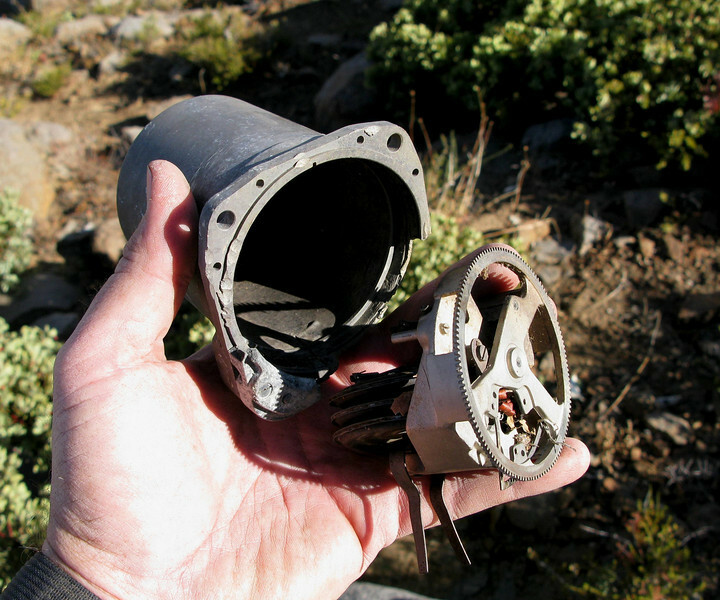 This engine mount appeared to have been un-bolted from the engine. A maintenance access door panel. 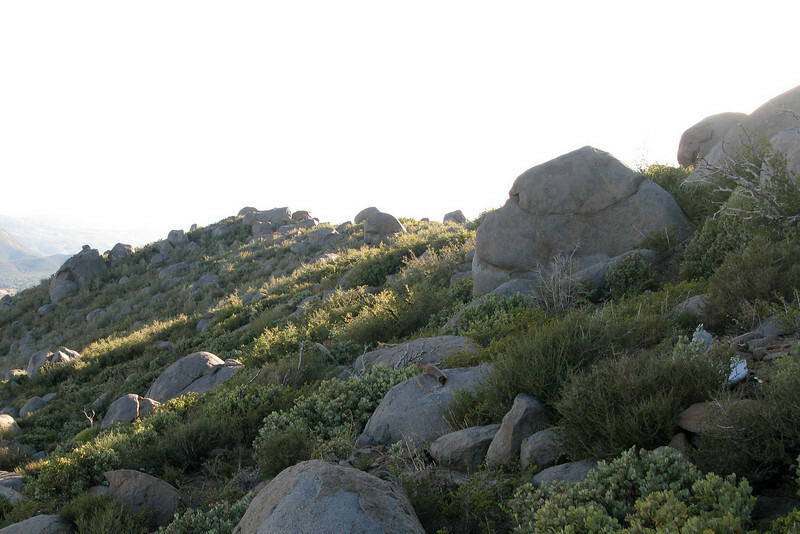 We were fortunate to have spent most of the late afternoon at the site. 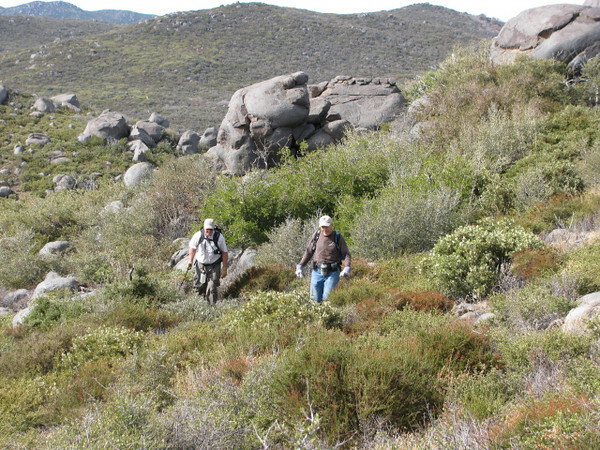 Even more fortunate not to have encountered any rattlesnakes.